Jim and Barb's RV Adventure: Say Hello to our Little Friend! When we started full-timing in March of 2014 four of us loaded up in the truck and left Wisconsin. There was Barb and I along with our two faithful companions Daisy and Bailey. Our first journey took us to Salt Lake and then onto Oregon where we were to have our solar installed at AM Solar. Unfortunately only three of us made it to that destination when we had to put Bailey down in Coos Bay Oregon due to some aggressive cancer. 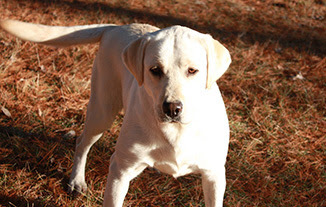 We have had a hunting dog of some sort for most of our 30 year marriage; a Springer Spaniel, a Chesapeake Bay Retriever and most recently Bailey, a Golden Retriever so there was definitely a void in our family. We have talked on and off over the past two years about getting another large dog but as many of you know that is a huge commitment, especially with our lifestyle. If we were going to do this we had certain criteria: #1 we wanted one of two breeds, a Golden Retriever or a Labrador Retriever, #2 we wanted a female and #3 we wanted a dog between 2 and 6 years old and did not want to go through the puppy stage, the chewing and potty training could ruin our rig in short order! With this criteria Barb has been searching for the perfect companion. There are a number of websites that she searched on a regular basis; entryexpress.net, gundogbreeders.com and ragom.org were the three primary sites she searched. In addition she contacted breeders in areas we were in to see if they had any older females for sale. There are not a lot of dogs out there that fit these requirements but the ones we did find were either it was too far away, too much money, the timing was not right, too much of a risk given the dogs issues or it just did not feel right. We thought we had found the perfect dog twice before; once was in Minnesota in the spring of ‘15 when we found a 3 year old Golden. We met the owner in a park and spent an hour with the dog and it just did not feel right and we passed. Our next opportunity was the fall of ’15 when Barb found another 3 year old Golden also in Minnesota. Barb drove over 10 hours from Ontario to see the dog and eventually bought her and took her to a friends house to spend the night before returning to Ontario. That night Barb called me and said that she just was not sure about the dog. Trusting her judgement she called the owner and returned the dog the next day. 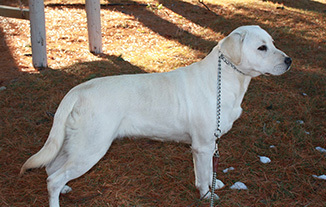 Over the next year Barb continued to contact owners when we found a dog that might fit. In each case we would include a link to our blog and explain our lifestyle asking the owner if they thought it would be a good fit. Many of the older dogs that were for sale were with breeders that were being retired or breeders that were not working out for one reason or another. Almost all of them came with some kind of issues as many of these dogs don’t have a lot of social interaction and life experience other than having puppies. As a result not all dogs could easily adapt to our lifestyle. To their credit, we had several owners tell us that their dog probably would not be a good fit and needed a more stable environment. Then there was the “perfect” dog that she found in California. The ad did not say how much the dog was but everything about it sounded perfect so Barb contacted the owner. The owner replied and said the dog was still available and she thought it would be a great fit with our lifestyle! Then at the end of the email we saw the price; $15,000! Excuse me? At first we thought perhaps the owner made a mistake and added an extra 0 but possible but when we contacted her again she said that the dog was really $15,000. I think we will pass on that one! At the same time Barb had been communicating with another breeder in central Minnesota who had a 2 year old female that they were considering selling. Barb again sent the owner a link to our blog, explained our situation and asked if she thought the dog would be a good fit. The owner replied that she thought the dog would be a good fit but were going to try to breed the dog during it’s heat cycle to see if she took and if she didn’t the dog would be available in a couple weeks. Two weeks later the owner emailed again and said that she did not take and the dog was available. We met her the next day in Fargo. As we were pulling into the Fleet Farm parking lot and I saw the owner walking the dog I knew in my gut that this was the dog for us! We spent about an hour talking to the owner, petting and walking the dog and getting a feel for her. She was very shy hiding behind her owner but considering this was the first time she had been off their property and the first time she had been for a car ride it was totally understandable. An hour later we were on our way back to Douglas with a new addition to our family! We went directly to Petco where we bought her a name tag (Sequoia) with our phone number on it as if she got away she would probably start running for Minnesota! We have now had her for 4 days and we absolutely love her! Each day is getting better and better, the first day she stuck to our sides like glue and was afraid of everything in her new environment. She did not know how to get into the truck and we had to lift her in and out. She did not know how to use stairs so we had to lift her in and out of the rig and she would try and bolt at any strange or loud noise. Think about it, all this is new to her, I can only imagine what is going through her head. Now, just a few days later she knows how to get in and out of the truck and uses the stairs to get in the rig and a ramp to get out. We moved our dining room table and fit a crate next to the couch. This is her "safe zone" where she sleeps and goes to when she is nervous. We leave the door open during the day and at first she spent most of her time in there. Now she only goes in there at night and a few times during the day when she gets confused or overwhelmed. Daisy on the other hand is not sure about this intrusion into her domain. Although they are getting along I think Daisy is waiting for this stranger to go back to where she came from. It is absolutely hysterical to watch her experience new things. Like the first time she saw herself in a mirror she did not know what to do and crawled up to the mirror to sniff the image, now she has taken to staring at you in the mirror. Or the first time she watched TV, she did not know what was going on. During one of her more confident times after a walk we approached the rig and she bolted up the stairs to get into the rig. Problem was the door was not open and she slammed into the side of the rig! Lesson learned there and she now waits for us to open the door. She has been off leash a few times and loves it when we throw a ball which she promptly retrieves so I am hopeful to have her hunting by this time next year. She also has a crazy habit that Bailey had, like a proper lady, she crosses her front legs when she is laying down. I know this is a long post just to say we got a new dog but as many of you know, it is not always about the end result, it is about the journey. This was a long 2 year journey but it was definitely worth it in the end! Congrats on the new addition to the family. She's a nice looking yella ! I can only imagine what Daisy is thinking in that third picture!! Classic!! Congrats on the new addition!! Good find, hope you all have a long, long time with her. Nice looking girl, that's for sure. Beautiful addition to your family!! Can't wait to meet her in AZ this winter. Ramp? Running into door? You know what they say about blondes! Shoulda got a black lab! ;-) Congrats though!!!! I am happy to report that she can get in and out of the rig without a problem now! Wow, that's great!!! Congrats. Looking forward to meeting her. Well I hate to say this but now we may have to interview for new friends. One dog we could over look. but now seeing that, that. It's even hard for me to say. That Pikachoo. Really? Do you play that on your phone also? Do you know anyone who likes cats? Ha, good luck finding new friends! The Pikachu is a long story as it was one of Forrest's favorite toys growing up. That is as far as we take the Pikachu thing, we have never done the phone thing. What a beautiful girl! Congrats! What a great addition to your family, congratulations. What a beautiful girl:) Love the crossed paws! So sweet that she has a new loving home:) I guess Daisy is like all only children in wanting to return this new member:) Hope she has decided to let her stay! Congrats! I guess the next thing is to get her used to riding in the side X side. Dianne is going to enjoy doggy sitting in Q! She is just getting used to riding in the truck, the Ranger will be another new experience for her! I'm so sorry to hear about Bailey and the void you felt afterwards :( But so glad you "rescued" the new one!! You guys must be really happy with your choice!! I love reading about other rv'ers and their adventures and your blog has convinced me to start one after I figure out how..lol. I will send the link to you once I get started. Thanks again for such an inspiring adventure!! We use blogspot, it is really quite easy to use. Let us know if you have any questions while creating your blog. Good luck! Wow, she is beautiful. Congrats on the addition to the family. Congratulations! She reminds me of our first Brittany Spaniel that we bought from a hunting preserve in Kansas. Everything was a new experience for her. Enjoy your new addition. Still a work in progress but we are introducing her to many new things and slowly getting her more comfortable with them. What an interesting odyssey. I will definitely check out those links. Glad you provided them. We have been telling Dakota about your dog treats, she cannot wait to meet you! What a lucky dog! I was happy to hear that you were selective about which dog would fit into your family and life style. It appears you made a great choice.